Port Dickson Triathlon 2009 and some TRI tips to try ! This will be my 3rd year doing the PD tri. 🙂 1st one was in 07. I am not so very excited or looking forward to this race (even though I am going )! .The Ironman hangover was more than I would have imagined and I am still recovering my knees.. It is somewhere near 90% recovered. I can almost feel it.And since I haven’t been pushing too hard on training, (to supplement the knees) especially the running part, I won’t push during the race this Sunday. straight out, and flat ! imagine boulevard between Putrajaya mosque to PICC and back. straight, flat and hot too !!!!! I can imagine how hot its gonna be on the run route on Sunday.. Which reminds me to bring my cap and ice water ! I am excited to check out how my physique and mind will score this weekend. But plan is to just pace myself and not push too hard. I haven’t had any open water swim since Ironman. But I hope it won’t be any problem.Plan for quick transitions in both T1 an T2..Bike and run; keep a pretty average cadence throughout,giving an extra effort on climbs,follow through on the descends. Run; pace ma self. Watch out for potential age groupers ahead for me and not get too excited. Last year I missed Michelle Looi by a second. I ONLY saw her the last 100m , chased her, and caught up, but was a second too late. I’ve a foto of me chasing her. Boy, I looked so funny in the foto ! datz Michelle at the front. Spot me. oohhh weee....someone marching and sprinting at the back ! Just focus on the course, the race, myself. Keep up a cheery mood, having the energy to shout a Hi! to a friend during the bike course and you’ll find the run course pretty relaxing. A quick transition would help too.. ! Don’t waste too much time at transition! I never actually set a specific target (say, doing a sub 3 for OD, a sub 7 for 1/2 IM or a sub 15hrs for IM)..In my ‘not -too- bad’ to ‘successful’ race results so far, I’ve always stick to this principle. I try to train smart, stick to the program. When it comes to race day, I should be ready after the weeks of training. Let the training speaks for itself now knowing that you still have some element of control during the race day itself. It doesn’t (really) matter to have people overtaking you (unless you’re aiming for podium LOL!). I usually start slow on each leg. E.g. I don’t start sprinting the moment I get on the bike, or the moment I get out of T2(bike-run transition). Start slow, pick up in the middle and finish ’em hard. I just happened to be lucky that I did a sub 3 in A Famosa Tri last year, a 3:01 in PD last year and a 6:25 in Desaru Last year. Basically, when its my first time doing certain distances in a certain race event, I won’t put much hassle in having a target time. It is a hassle and mind obstacle then, when I put a target, and not achieve it. My 1st OD, 1/2 IM, 1st Ironman ; no target. But for Ironman, since there is a cut off for swim, I need to finish by 2 hours to be safe. That was my target swim time for IM. Total swim time for Ironman , 1hr 35mins. I know its slow compared to my other mutant swimmer friends. They swim like fish ! I swim like a tortoise ! 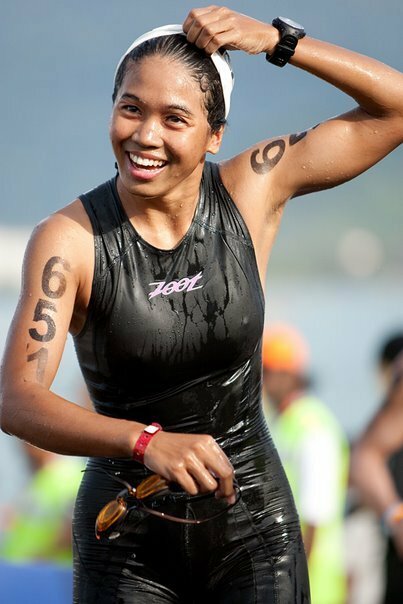 But anyways, it was home run for me in Langkawi this year after I finished my swim leg even though (again) I had no specific target time for the Ironman distance. I had no pressures on me. I just totally enjoyed, or tried to enjoy the course.Same goes to the other races ,so far. Ironman Langkawi 2009: out of the water. finally ! 1 happy Julie ! 1hr 35mins ! Incredible enuff for me ! i was beaming with joy having in mind that i have another 180km + 42 km to go !!! For my 3rd PD outing , I would have to take it easy due to my condition now. So no pushing hard for me! Gotta remind myself that ! Oh yeah, usually when it gets pretty hot on the bike/run course, do make a pit stop at the water stations and pour some water on your head. The cooling effect has a tremendous positive significance to your performance .Have a laugh too! yeah, sounds funny.. i usually laugh during my training, especially when there’s a serious dogfight going in between you and your training mate.You break the seriousness and tense by laughing ! makes me feel less tired.No, seriously ! it works! Laugh for a reason, or look for a reason to laugh . Its not that hard ya know..hahahah.. If you feel good during at the midpoint of a the swim/bike/run leg, safely expect that the second half would look good as well. Remember you gotta learn the skill of ‘controlling’ yourself, and how controlling too much isn’t as good as you might have thought it would. Push 1 ‘gear’ up, gradually.. don’t push from the 2nd to 4th ‘gear’ abruptly.. or else you might find yourself slowing down after that ! Another tip ; I’m not so techy and gadgety, but I can’t deny the importance of having gadgets. A quick revelation here; I never owned a bike meter/ heart rate monitor until recently. I borrowed them from my ex ! That was until recently when I got myself a Suunto t3c. I do use these gadgets time to time for training and racing. But most time, I would not bother the meter on my bike or the watch on my wrist. I don’t do heart rate monitors as well. 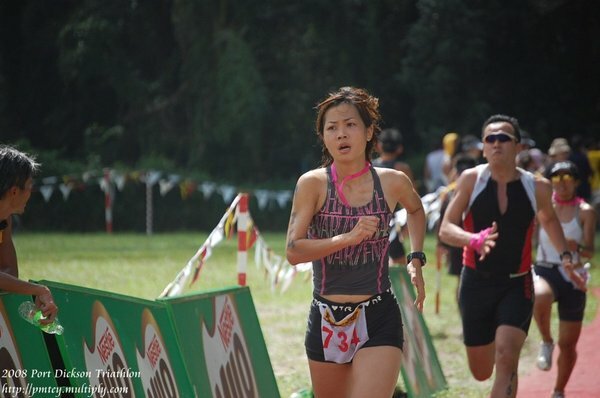 I remember Powerman Malaysia last year, my 1st Powerman Duathlon. 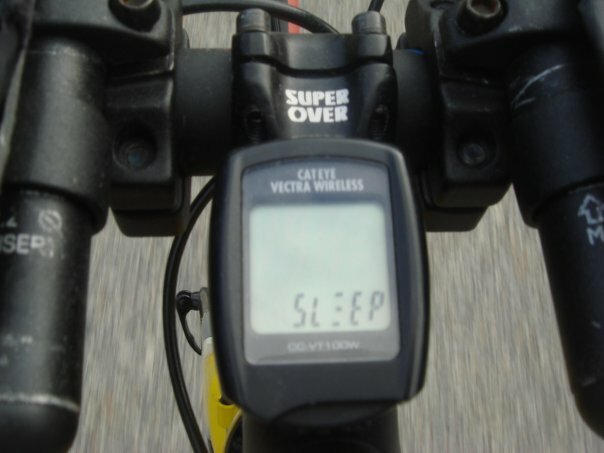 I had a meter on the bike,and I can’t help but keep looking at it every other minute. It is a distraction in a way.. I couldn’t concentrate on the race ! I tried not looking at it and ignore it. 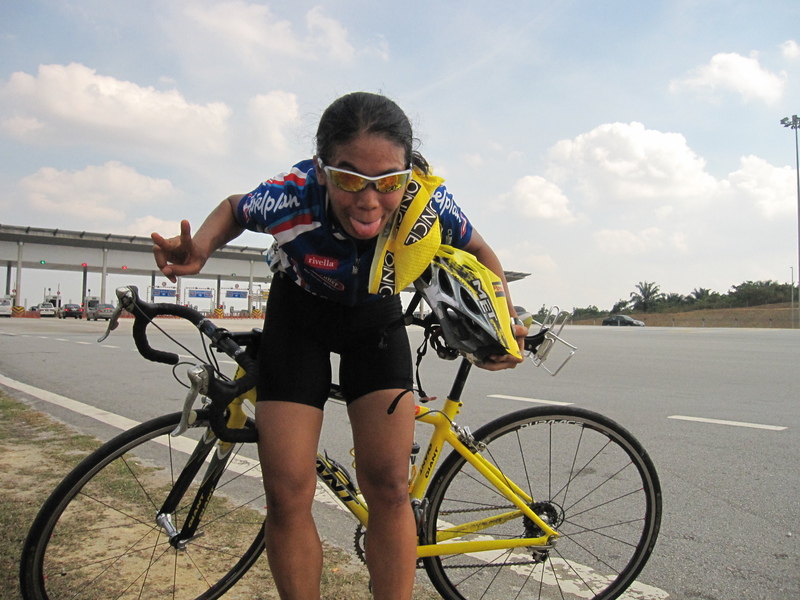 Boy , it wasn’t easy.I remember going for a long ride with Shazly, Stupe , Fong and Rashid.. I was wearing my bling bling white leather Guess watch! So unconventional? U may think so.. but I don’t ! 1st Conclusion to this paragraph; what ever you don’t do during/in your training, don’t bother doing it in a race. Its more of an annoyance, really. For my bike, training, usually I don’t have a meter on the bike.., so it doesn’t matter to me.. speed to me is subjective, tho time to time it is nice to check out what’s your average . 2nd conclusion : focus on the race and listen to your body.This is my point of view ! during 1 of my rides ! meter says SLEEP ! I don’t have to be conventional to have achieved what I have achieved so far in my sporting attributes. You can achieve a certain peak by blending a certain amount of recipe.. and when you have achieved that peak, move on to the next level. Tweak that recipe. 🙂 I’m tweaking mine for my next Ironman. And I am looking forward and pretty excited for it ! To all of you doing the race this weekend in PD, whether 1st timer or no, I wish you all the best. Don’t forget to say Hi! to me !!!! 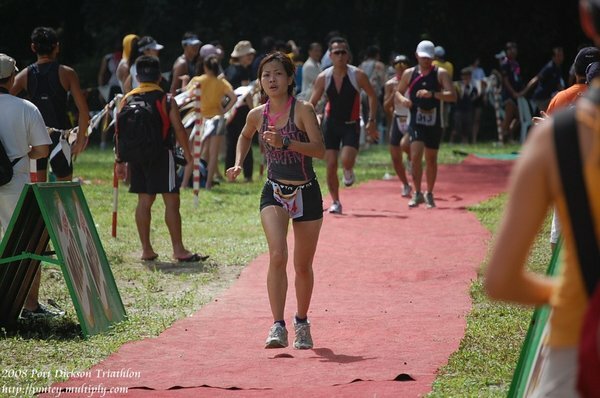 Port Dickson Triathlon 2007, my 2nd Sprint Tri. photographer manage to capture me arse during bike-run transition. PD Triathlon 2007 : a wet day ! but still need the wet spongy ! post ride pose ! hahah... thanks Adni ! I of my gila hours of training.... 2.30pm ...krazee ! I missed Langkawi alrite !!! training how to become a hantu raya in broad day light ! Terima kasih Hairi ! and thanks ye drop by blog ini.